Its mindbogging how this new mobile site can be seen as an improvement. Is there a way to fill the page horizontally? Because this a lot of wasted empty space, especially on a 1440p monitor and imagine even more so on a higher resolution screen. Looks more like a a CRM portal than a forum. Yeah, I don't know what XF was thinking. Slide-out hamburger menus on the left requiring a tap in the hardest to reach corner on the screen is just plain obviously bad design from a UX perspective. What were they thinking? I love ResetERA, but I really foresee a mostly negative reaction to this update because it's a regression in a bunch of little ways that matter a lot. And I say this as someone who prefers Day/Night ERA over the legacy themes. There should be an option for that in the bottom left. And no way to not have to deal with it now.. The new mobile site is so far away from anything that should be pushed out and I don't understand why this update needs to happen now on the 2nd instead of taking your time and letting the beta run as improvements are made over time with continued feedback from the users and then once it feels like a great improvement over the current site its released. I second the idea of a 24-hour timestamp option. This is something we will investigate post-launch. If we can do it, I think it would have to be optional. Love it or hate it, unicode is now close to a universal standard. Refusing to adopt unicode over the long term carries real security risks. It really isn't optional. There are user-side solutions that might help you filter them out, but just about every modern website today will support unicode (and therefore emojis). Thanks! If it is not possible, or just not worth the effort, I understand. But I am glad it's on the agenda at least. You can't turn off emojis while keeping the unicode? I am not versed in Xenforo, or modern website development in general for that matter, but it sounds strange that it is such an all or nothing thing. Either you adopt unicode and everything that comes with it, or you don't adopt it at all? Emojis are part of Unicode, they aren't a separate thing. Filtering emoji out of text would mean introducing text parsers where there are none, which is where the server load and security concerns come in. That is essentially correct. I do apologize that we can't please everyone here. I see. I think I am still stuck somewhere in the 2000s with my head, as I remember emoticons being a thing you could just enable/disable at your own leisure. But apparently emojis work a bit differently. No need to apologize, Cerium. If anything I should apologize for jumping to conclusions. We've added an indicator for the OP of a thread. This time it will appear as a diagonal ribbon across the corner of their avatar. The ribbon only appears on the OP's replies, not on the first post itself. We also removed the "green dot" online status indicator, added subforums to the mobile main page, and adjusted some of the vertical spacing on the mobile view. Not sure if I like having posts in a tread separated by being each in a floating container it makes it look messy. The black line and the gray and darker gray background was perfect. Basically, emoticons on forums up until recent history were just regular embedded images that the forum inserted when it saw you had typed keyphrases or keywords into a post. Emoji aren't images from the forum software, but are rather part of Unicode itself, and not only that, they can do interesting things like combine with other text to make new images, or alter regular text. The forum software doesn't see them as emojis itself, it just stores the Unicode and then sends them to your browser and your browser decides how to render them out. This also allows most all languages of the world to be implemented in a sane way. No, the beta forums are read-only so you can't create threads or reply to posts. Thank you for this, especially the spacing. Am I right in thinking this only applies to the thread tiles/subforum which is much better but not the posts in said threads? That really needs to be fixed. Looking at some threads with current mobile legacy I can see 3 or 4 shorter posts on my screen simultaneously and only a maximum of 2 on the 2.0 version. Just a little blemish that I noticed today. 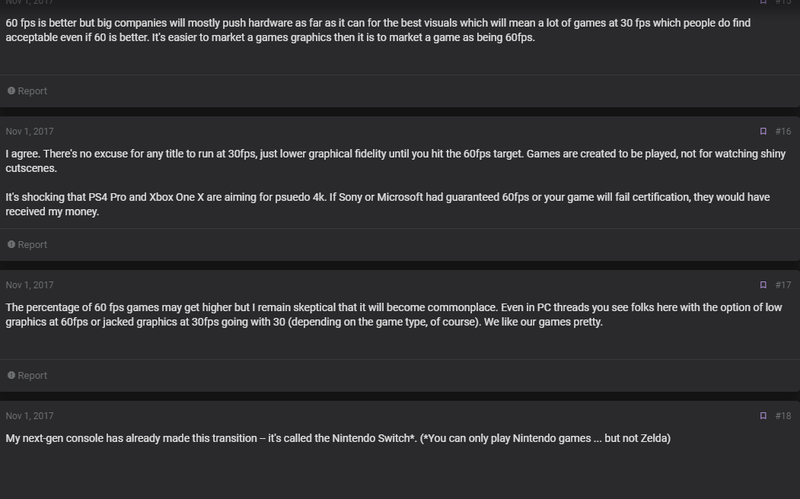 I typically browse ResetERA at work in a window in a quadrant of my 1080p screen. It scales perfectly fine to this size in the current themes, and it looks fine in 2.0 as well. But the sidebar displays a rather unsightly scroll bar at this size. It only scrolls down a few pixels. Would there be any way of having it not display a scroll bar at any size? Edit: well, nevermind. Tried opening it again after opening it on Chrome and it works as intended now. Weird. Neat! I've often scrolled quickly through a thread to find a reply from the OP so these flags are good for me, but any thoughts around making it more visible? 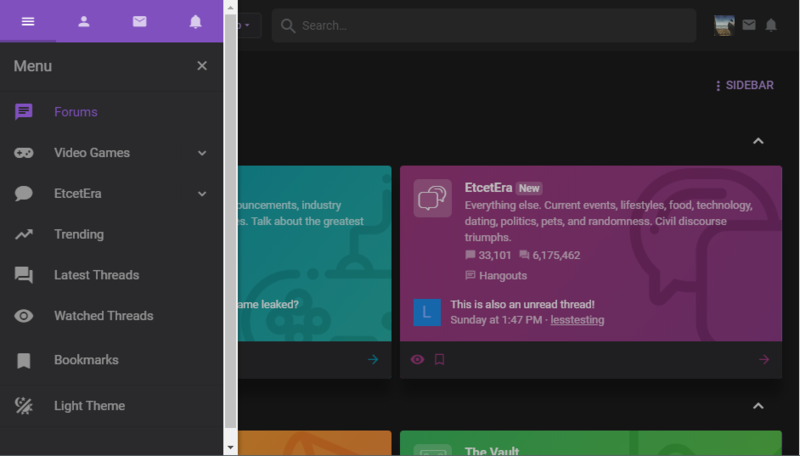 Right now on dark mode it's basically the same color as the background, I see it if I look at it sure but it doesn't jump out if I'm scrolling looking for it. Probably mentioned already, but it'd be nice if the "down" jump button on the bottom right of the screen wouldn't literally take you to the bottom of the screen but would stop at the last post on that page of the thread. I think you're just using Night/Day Era. 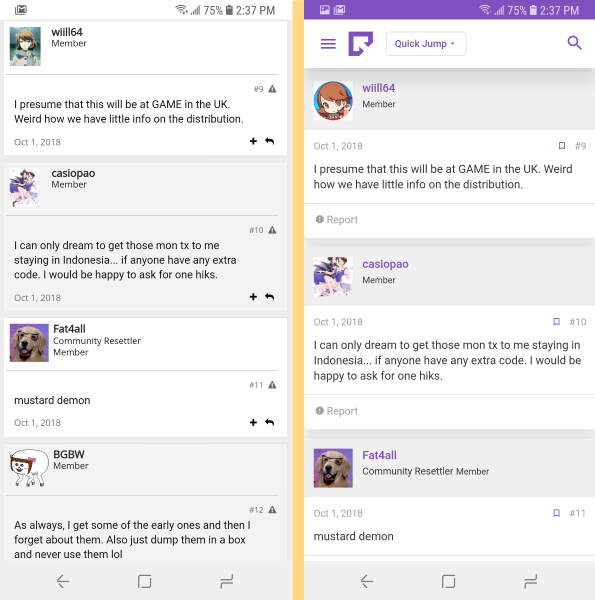 You need to go to the beta.resetera.com, log in and set the design style at the bottom to one of the resetera ones. No, this is on beta.resetera.com. It acts the same in the light and dark versions. Jumps right to the very bottom of a page. This might have been mentioned before, but I don't like that the quick jump is a drop down menu. That means I'll need to do an extra click every time I want to change forums if I don't want to use the sidebar. iirc the first time I checked the beta it wasn't like this, and was more like how it is currently. I'm not feeling it all. When it first launched the top nav bar would auto hide when you scrolled down but you had to go back up to the top of the page for it to reappear. People wanted a more fixed solution and this was the change. Would it be possible to just turn the "quick jump button" into a small button? Instead of having the width of almost 4 Icons just make it a small button then the Profile picture, inbox and alerts could also always display on phones. Probably my biggest complaint. Also does the thread title banner thing at the top really need to be so big. Page selection on mobile is still a pain. Really no way to go back to displaying the last several pages as small buttons as is the case now on Era? This way you can quickly jump between the last several pages instead of having to go back single pages or input a page number to get there. Just makes going through a thread to look for a post on the last few pages really annoying. Still think there is way too much at the bottom of the page. getting to the bottom of the page should really just be the last post and your reply box. Is it not enough for the Era Clear ad to be on the front page instead of also at the bottom of every page. Not to mention the similiar threads stuff. No way to make this something that is minimized and you can open it if you want similiar threads? I liked how it looked already but I'm really digging the new design. Why is there not a tick box next to threads (to either ignore them, watch them, or mark them as read)? Why the need to enter a thread to do that? I still think the last post/first post arrows need to be moved over to the left next to the thread title. They're useful links and they're buried on the right side of the page, whereas useless information like page views is in easily clickable range compared to the thread title. So, compared to the existing mobile site I'm missing one post per screen. While I like the new design in general, I really dislike this part of it. Not sure why the report button needs its own row and why it needs to be so central instead of being a small button at the top to the side. Reporting should be a last resort thing but on the new site it is so present that it looks like a commonly used feature. Read the post? Wanna report it now? The line with report in it will have reply and quote in live. Yeah I wish it was all a little more compact as well. But maybe Report should be more prominent, it helps mods a lot I would think, so I'm ok with it moving to be more visible. Agree. It's better now than how it first was, but it should just be the icons at the bottom of the screen like how it is on DayEra/NightEra. That works flawlessly and is great for one-hand browsing. Whether or not they're ever able to implement a bottom navbar in 2.0, I think that 1.5 will possibly forever be missed for that reason alone. The bottom navigation is simply perfect on mobile. One-click access to every part of forum on the most easily reached part of the screen. I don't think it's hyperbolic to say that it's objectively better. But don't get me wrong. I totally understand why the staff is moving to the latest XF platform, and I love some of the new functionality that comes along with that. I'm just holding out hope that the navigation UI will be tweaked down the road because as it currently stands it's a pretty clear and significant regression from what we had. That said, I understand that making those changes would necessitate custom code once again, so I don't expect miracles in the short term. I actually hate the bottom bar in 1.5, I think its too big, if it was just the icons OR the names it would be fine, but its so large and in the way. Personal preference and all that though. Lots of things wrong with 1.5 though, Im really glad 2 is looking so good. Agree. Really hate the whole look of 1.5 especially the bottom navigation bar. Either implemented into the top/bottom of the page like legacy or how it is in 2.0 now. Just think the quick jump button needs to be smaller to allow profile, inbox, alerts to also be able to always be displayed on phones in the permanent top bar. The top bar doesn't seem very useful anymore. It's kind of unnecessary now that the quick nav is in a dropdown. Hopefully someone can create an alternative similar to the current bar so I can hide the side bar. The top bar is very important for phones. A bottom bar would be important for phones. The top bar is just as hard to reach as the hamburger icon for the sidebar. Right now both the sidebar and drop-down take two clicks to get anywhere and are at the top of the screen. Not much different, and both are strictly inferior to 1.5's bottom navbar. Prefer it at the top. You start at the top of the page where the top bar would be even if it didn't scroll with the screen. It isn't in the way as it is just covering stuff you already read and scrolled past. Meanwhile a bar the bottom is always in the way, always blocking what you are about to read. Its rather annoying. My only complaints about the top bar are that it's thicker than it needs to be so I feel like it's wasting space, and I think they could put actual nav buttons in there instead of the dropdown per a previous suggestion in here. But then I think my main complaint about the new design in general is that it wastes a lot of space inefficiently. Though overall I still think it's a world of improvement over the last visual overhaul so I'm not rattling the cage very hard. I broke up with 1.5 pretty quick but me and DarkEra Legacy only have a couple precious days together left.